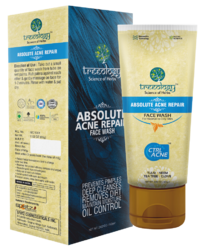 We are a leading Manufacturer of whitening face wash, mandelic acid face wash, anti pigmentation face wash, skin lightening face wash, face wash and skin whitening face wash from Ahmedabad, India. Formulated with whitening complex in Liposomes tehcnology, the encapsulation of active ingredients into liposomes facilitates their delivery to the skin, inhibit the tyrosinase activity offers an excellent skin softening agent. It reinforces the skin's natural defense barrier by carrying moisture into deeper layers of the skin and it supports the restructure of the cellular cement. Exfoliates dead cells from the skin surface & brighten the skin tone. Papaya Exfoliates dead cells from the skin surface & brighten the skin tone. The encapsulated Vitamin C & Glutathion. Carrying moisture into deeper layers.
" Perfection Peptides " Act as anti Aging. Inhibit the tyrosinase activity offers an excellent skin softening agent. The perfect anti-ageing face cleanser for men to use before and after shaving. It is ultra-concentrated, deep cleansing, soap free, pH balanced with a high concentration of frankincense oil, which is a natural antiseptic and antibacterial. It is ideal for cleansing the skin and helping to protect it from spots and shaving rash. It contains essential oil of lavender that has soothing, healing and astringent properties, aloe vera and Provitamin B5 to moisturise and help prevent skin dryness. Dissolves excess oil and eliminates dirt and debris while maintaining the skin’s natural balance. Its calming action makes it Ideal for sensitive skin. CA Face Wash Repair leaves the skin cleansed, smooth and perfectly prepared for shaving. Concern: Detoxifying gel cleanser delivers a deep-pore clean, draws out the dirt and excess oil that can clog pores. • Activated Charcoal, Bambusa Vulgaris (bamboo) Extract, Malachite Extract, Lepidium Sativum (swiss) Sprout Extract, Hieracium Pilosella (hawkweed) Extract, Albizia Julibrissin Bark (silk Tree)extract, Gaultheria Procubems Leaf (dhasingre Oil) Oil, Aloe Barbadensis (aloevera) Extract. •It is gently cleans away impurities, leaves all skin types feeling fresh, comfortable. ASBAH Pure Man Activated charcoal scrub will deeply cleanse your skin by removing your dead skin cells. The scrub will gently exfoliate your skin and eliminate your pores and acne. Your skin will be refreshed, bright and youthful. Active Ingredient : Apricot Seed Powder, Activated Charcoal Powder, Coffee Bean Extract, Sunflower Seed Oil, Grapefruit Oil, Peppermint Oil, Base Q.S. Direction: Moisten face and neck with warm water. Apply a small amount of facial scrub with wet fingertips and gently massage into skin, avoiding the sensitive areas near your eyes. Rinse well with warm water and pat dry. Usage/Application Apply a small amount of face wash to wet hands, lather and rinse thoroughly. Material Activated Charcoal Powder, Vitamin E, Vitamin B5, Triclosan, Soya Protein, Base Q.S. Asbah Activated charcoal face wash which works vigorously to aerify and exfoliate dead skin cells from the skin. It's anti pollutant formula that clears excessive oil, dust & gives instant glow. Apply a small amount of face wash to wet hands, lather and rinse thoroughly. 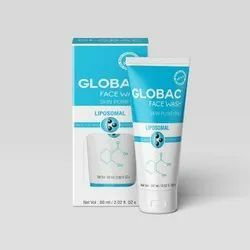 Globac Face wash is formulated with most advanced technology using Salicylic acid, Glycolic acid in Encapsulated form while Australian finger lime used is the new generation of AHA. Encapsulated Salicylic acid from Salix Alba (1.6% W/V), Encapsulated Glycolic acid from Sugarcane (1% W/V), Australian finger lime (Citrus Australasica) (2.0% W/V), Nicotinamide(2%W/V). Aqua, Lauryl glucoside, Decyl Glucoside, Cocoamido propyl Betaine, Pyrus Malus (Apple) Fruit Extract, Prunus Persica (Peach) Leaf Extract, Rubus Idaeus (Raspberry) Fruit Extract, Prunus Cerasus (Bitter Cherry) Extract, Sodium Gluconate, Perfume. 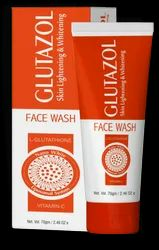 Glutazol Skin Lightening & Whitening Face Wash is power packed with Nano White Liposomal System formula. This antioxidant rich Face Wash clears the body of free radicals and toxins. Active Ingredient: Carica Papaya (Papaya) Fruit Extract, Mangifera Indica (Mango) Fruit Extract, Aloe Barbadensis (Aloe) Leaf Juice. Papaya: Exfoliates dead cells from the skin surface & brighten the skin tone. Papaya:Exfoliates dead cells from the skin surface & brighten the skin tone. 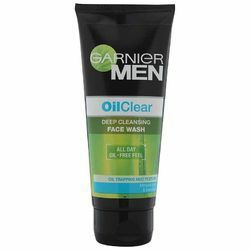 Garnier Men creates Oil Clear Face Wash: The 1st deep skin purifying face wash for men: It removes excessive oil without drying while ensuring a day-long oil-free feel. Removes excessiveoil without drying: Its special oil-trapping mud texture eliminates excessive oil without drying for an intensive anti-grease action. We are dealing in Orison Pharmaceutical Skin White Face Wash.